The present work reports the prospective applicability of three indigenous rootstocks belonging to different species viz. Nemutenga, Tayum and Tasi cultivars of north eastern Himalayan region for producing Citrus tristeza virus (CTV; a viral species of the Closterovirus genus) free quality planting materials of Khasi mandarin (Citrus reticulata Blanco) through micrografting or shoot-tip grafting (STG). The development of disease-free plants through STG is essential as CTV is in vivo transmissible through infected bud sticks. The technique of STG along with the diverse culture parameters like effect of sucrose, plant growth regulators, pre-treatment of scion and stock, effect of scion size after thermotherapy and grafting method was analysed. Among the three indigenous tested rootstocks, Nemutenga was found superior showing maximum STG success of 58.5%. STGs using scion size ranging from 0.3 to 0.5 mm, survival was up to 42.0% and completely virus-free. Pre-treatment of scion and stock with kinetin (1.0 mg L−1) was found more suitable than N6-benzylaminopurine (BAP) and further increased the rate of micrografts. For further growth of micrografts, Murashige and Skoog medium fortified with 0.5 mg L−1 BAP and 0.1 mg L−1 indole-3-acetic acid (IAA) along with 5% sucrose resulted in maximum (56.8%) response. Considering the two techniques applied for STG, cleft grafting was found more suitable than inverted T grafting. Viral assessment with enzyme-linked immunosorbent assay (ELISA) and reverse transcriptase polymerase chain reaction (RT-PCR) revealed negative results for all plants from 0.3 to 0.5 mm scion while 0.7-mm scion-raised micrografts showed 60% negative with RT-PCR for CTV. The online version of this article ( https://doi.org/10.1007/s11627-018-9946-6) contains supplementary material, which is available to authorized users. 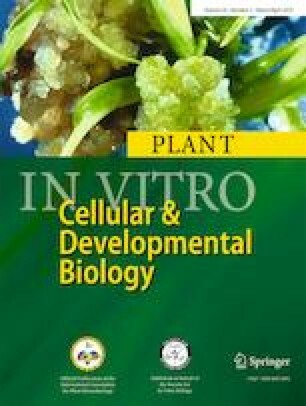 Authors acknowledge the laboratory as well as library assistance from BCKV, West Bengal. Amit Kumar Singh, Ng. Tombisana Meetei and Nirmal Mandal conceived the idea, surveyed the literature and designed the experiment. Amit Kumar Singh conducted the experiment and Suprabuddha Kundu as well as Umme Salma assisted for the experiment. All the authors contributed in writing the manuscript and accepted the final version. DBT provided grant (BT/04/NE/2009) under the project Advanced level Institutional Biotech Hub, CHF, CAU, Pasighat.